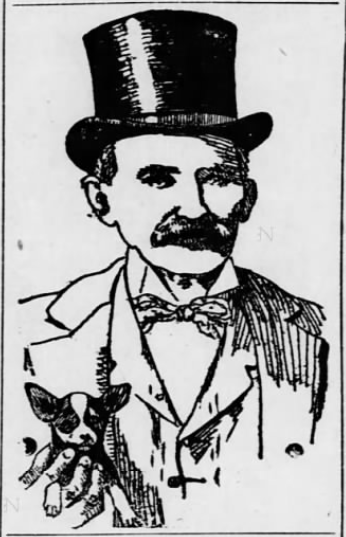 Mike Brannigan; from the El Paso Herald, July 24, 1899. He Numbered His Friends and Acquaintances Among Millionaires and Could Secure a Pass on Any Road in the United States. Colonel Mike Brannigan, the hackman and one of the best known residents of El Paso, died suddenly this morning at four o’clock of heart failure at his residence on North Oregon street. Mike, as he was familiarly called by all his friends and acquaintances, was slightly ill yesterday and Dr. Justice called to see him during the day and left a prescription. The sick man complained of pains in his left side in the region of his heart, but the trouble was not considered serious. Last night he was restless until about 3 o’clock. He talked constantly about the business of the morrow and was up and down during the night. “Just about 4 o’clock,” said Mrs. Brannigan, “I told him he had better leave a sofa in which he was sleeping and get in bed. A few minutes later I heard him breathe heavily and went to him. I shook him violently and told him to get up, but he did not stir and continued to gasp for breath. The funeral will take place tomorrow morning under direction of Emerson and Berrien. It will be held at the Catholic church, at 8 o’clock, and requiem mass will be said. Deceased came to this city from California and had been a resident 13 years. He was born in Ireland and was 70 years old. In 1846 he landed in New Orleans and during the gold excitement in California left New Orleans for that state and was there during the rush of ‘49 and ‘50. Mike was known from San Francisco to New York and had friends among all the millionaires who prospected in California in the early days. He and millionaire John W. Mackay were boon companions in 1849 and whenever he passed this point he and Mike always spent a social hour together talking about old times. Mike was intimately acquianted with the late Senator Hearst and some time ago the widow presented the hackman with a double harness trimmed with silver on account of the friendship existing between him and her husband. It was Brannigan’s boast and pride that he could get a pass over any railroad in the United States on account of his influence with millionaire railroad men. Brannigan leaves a widow, but no children. He was married 24 years ago in Galveston. His nephews, Edward and Pat and Jim Sexton will arrive from Chihuahua and John Sexton from Casas Grandes to attend the funeral. “Mike Brannigan was a man with a heart as big as a house,” said Mr. Berrien this morning, after he had called at the residence of deceased to look after the body. Mike Brannigan led an eventful career in the early days in California, if reports be true. Prior to the time he married and settled down his life was full of exciting incidents. He was a gold digger in ‘49 and not meeting with any great amount of success concluded to seek his fortune in another direction. He owned and operated hacks both in Sacramento and San Francisco, California, and made money. Mike was of a turbulent and restless disposition when he was young, however, if reports be true, and got into some trouble in California, when the population was unsettled and lawless, and was given notice by the vigilantes to leave town. He went to New York and the entire press of the country was in an uproar about it. Mike was interviewed by reporters of all the leading papers and quickly became widely known. He threatened to sue the city but nothing ever came of it. He afterwards came to El Paso and located and during his residence here has been exceedingly hard working and attentive to his business and made money while his competitors slept. He used to tell a good story on himself about selling a Chihuahua dog to a tourist. He had a little Newfoundland pup and sold it for a fancy price to a man who wanted to buy one of the famous Chihuahua dogs. The man took the dog east and it grew to be the size of a burro. The tourist had to laugh and admit that the joke was on him. Mike Brannigan’s funeral occurred at 8 o’clock this morning. It was attended by a large number of friends of the deceased. Requiem mass was said at the Catholic church and the funeral procession afterwards wended its way to the cemetery. Brannigan, who had been a hackman in this city so many years, owned and operated the first hack in San Francisco at the time when it cost $100 to take a ride in a carriage.